I was super excited to receive The Cat of Bubastes. This is not just an average audio book. The Cat of Bubastes is more of an audio drama. It features well-known celebrities such as Anthony Daniels, Brian Blessed, Elizabeth Counsell, Russell Boulter, and John Rhys-Davies. The Cat of Bubastes takes you back in time to ancient Egypt. There is a young prince named Amuba and his faithful mentor Jethro. They are captured by the Egyptians and enslaved in the city of Thebes. They find themselves trapped in a murderous plot to attack the family of their Egyptian friend. Along the way, Amuba and Jethro discover the mystery and wonder of God's will. 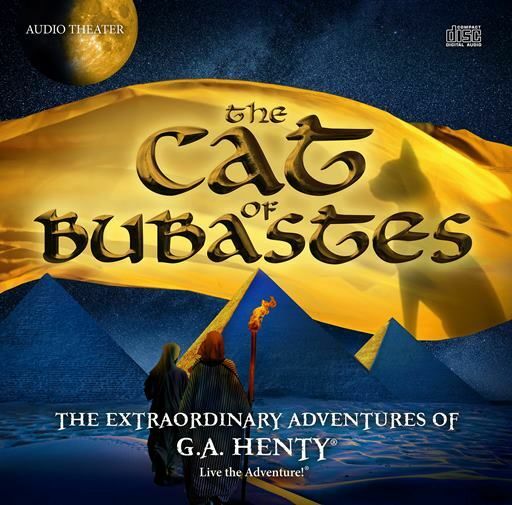 The Cat of Bubastes is a audio drama that keeps the kids attention. Not only were we listening to a wonderful lesson in character development, but it was like watching a movie. It was not just a boring audio book. Most kids like watching movies, but The Cat of Bubastes was like watching a movie without pictures. We could close our eyes and really get our imaginations going. Available also to go along with the audio drama The Cat of Bubastes is an easy to use study guide. This full-color PDF is available for download with your purchase of the audio drama. It has a lot of maps, vocabulary , historical facts and stories, reading comprehension questions, critical thinking questions to get your students really remembering the wonderful story they are listening to. I am a HUGE fan of making history more fun and interesting. This new audio book from G. A. Henty will keep you guessing. The Cat of Bubastes is definitely a way to get your student more excited about their history lessons. I can't wait to see what else that Heirloom Audio Productions has in the works for release. Several members of the Homeschool Review Crew were given the opportunity to try out The Cat of Bubastes from Heirloom Audio Productions. See how they used it in their homes and how it worked out for them by visiting our blog. One of the most common learning delays that parents face is that of reading. It's the one that I read most about, and it is one that we have experienced with both of our girls. We still struggle with it. We recently had the chance to review the Ultimate Phonics Reading Program from Spencer Learning. The Ultimate Phonics Reading Program contains over 250 reading lessons that were created to help to improve and build confidence in readers of any age. You could use the Ultimate Phonics Reading Program for students with learning disabilities, ESL, or even those who need some spelling help. Each lesson is broken down by the sound that your student is working on mastering. It teaches all of the rules of English that are difficult to keep track of for most students. Parents do not need to have special training to use the Ultimate Phonics Reading Program. It is very easy to use, even by the student independently. The Ultimates Phonics Reading Program is not an online program. It is downloaded to your computer, so it can be used at anytime. This was nice, because I could turn the wireless off on my computer while Caty was doing her lesson. Then instead of her pretending to do her work, but really be playing an online game, she had to actually do her lesson!! There are no distracting cartoon characters that needed their houses built or new clothes to dress them in. This is not her favorite part of the program. She likes the cartoon characters, but I find them that she plays but not in a good way. Each lesson in the Ultimate Phonics Reading Program was short and did not take a large amount of time, which is great for those with short attention spans. Because this is where the the non-flashy can come into an issue, especially with Caty. She needs to have a bit of flash to keep her attention, since her brains moves at such a fast speed. At first she thought this program was boring. But after a few lessons, she realized how much time it really was and she complained less about no cartoon characters. The Ultimate Phonics Reading Program can be used with any reading program or as a stand alone program. I like how it reads the words to the child when they hover their cursor over it. The voice is not hard to understand. We have purchased some programs and it was horrible. You could barely understand what the voice was saying and this caused issues with children who already have speech issues. So I was pretty happy with how easy it was for Caty to hear the sounds and words. The Ultimate Phonics Reading Program is very user friendly. Easily downloadable and can be used by a wide variety of students of all ages. For only $69.95, it is on sale Until Friday, September 30th for $49.95, you get a full phonics program that you can use repeatedly with your entire family. No subscription fees. With 262 lessons, that can be full printed, and free lifetime updates, this is really a great purchase for your family. Caty will continue to use the Ultimate Phonics Reading Program since I have seen an increase in her ability to remember letter sounds. We will also use this along with our spelling program to have her remember her spelling words. Several members of the Homeschool Review Crew were given the opportunity to try out the Ultimate Phonics Reading Program. See how they used this program in their homes by visiting their sites below. It was very busy week. We had a couple of field trips, lots of work to finish. Bu we made it through....I should say our educational checklist was done. But so many other projects I needed to work on didn't get finished. The life of a work-at-home mom. The girls' scout troop had a field to our local Apple Store. They were able to create comic strips using a comic app in store. This was a very neat hour-long project. There was room for siblings, so the boys were able to do it also. Last week, we finished planning what they wanted to do. This made the process much quicker. They all enjoyed this. Then we had Lego Club. Our team is the Powerful Penguins. So we are learning about bees and warm-water penguins. This week they learned a little about honey bees, and we brought some honeycomb for the kids to try. History: This week we continued with the Civil War. We learned about some of the final battles of the Civil War. We started learning about the period of Reconstruction also, this included learning about sharecropping, carpetbaggers and the beginning of the Ku Klux Klan. We went on a field trip to a hidden Ohio gem. I was doing a web search and found a Civil War museum in our area. Turns out it is the only one in Ohio. So we headed out to see what they had. It was a cute little museum with lots of information, and we learned some new things that were not in our textbook. We picked up this movie about the Andrews Raiders during the Civil War. This event was not in our textbook and they had an entire section at the Civil War Museum. So after learning about it at the museum, we watched this together. It was a nice movie. We still have a couple more weeks of review. I don't want to start our next section in History until after we come back from vacation. So we'll continue to watch some videos on the Civil War and I think we are going to make a battle timeline also. The Civil War Museum had some nice worksheets out for students, so I picked up a few to use over the next two weeks in our studies. Science: This week we finished up Sassafras Science Anatomy. We learned about the digestive system, the excretory system and the reproductive system. It was a lot of material. But we were trying to finish it all up this week. We made models of the Stomach and discussed the process of digestion. We watched lots of videos this week on our digestive and endocrine system. We also watched a video on how a baby develops in the womb. We talked about germs and how to keep our systems healthy. We did the germ project to show how we have to really wash our hands. 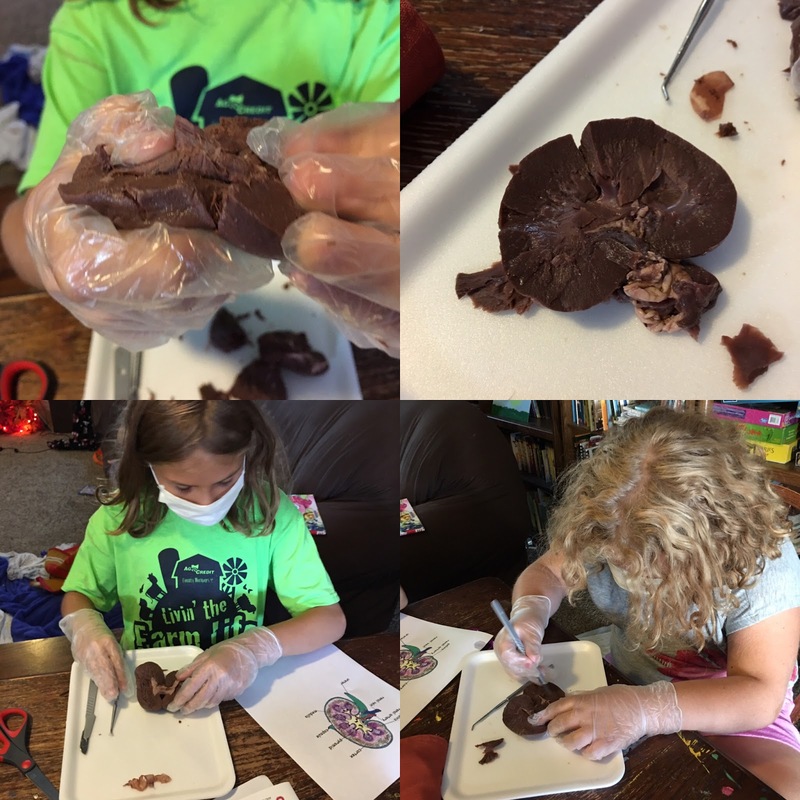 The girls dissected kidneys as their final anatomy dissection project. Student Affairs (Government): We started watching the CNN Student Podcasts this week. It's definitely easier news for Joey to listen too. The kids worked on grammar review of singular/plural nouns. And in Math it would double digit addition without carryover. I feel bad because we really concentrated on group activities this week. It was a bad attention week, so we did not get to projects that I wanted to. Next week is going to be a hard week for extras, but I'll see what we can get done. I have some interesting food history picked out for her to watch. It was one of those weeks where I do not feel like I accomplished a lot. I know that we did a lot. We really made our way through our history unit. We also finished our Anatomy sooner than I planned. We will be starting a Botany study next week also through Sassafras Science. As we are making our way around the continent of Africa, Lydia made an international meal to fulfill a badge requirement. She made green olive Moroccan chicken and a flat bread that they also make there. It smelled wonderful and Joe said she did a really good job. This is one of his favorite meals. I haven't made it for ages. Caty and Lydia were kitten sitting this week. They were about a month old. This kept me on my toes. 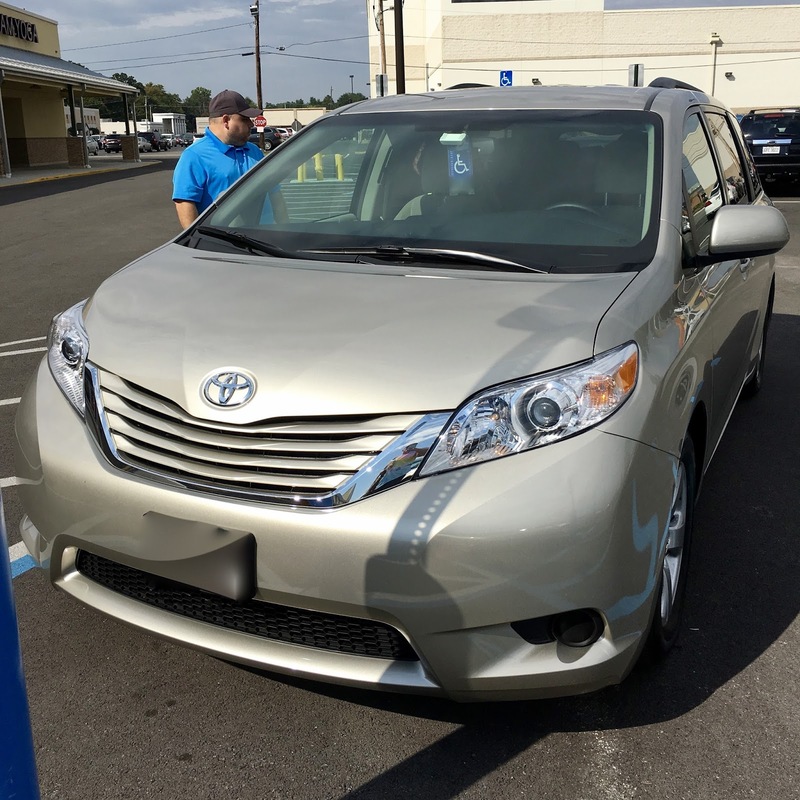 We traded in our 2011 Sienna and got a new 2016. It wasn't something we planned, but we got the greatest deal. So we went with it. 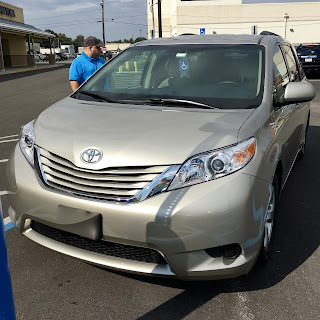 There's not much difference from our other van. Just without all the extra mileage. We had a busy Saturday. We made it a big family day. First we started out at the BGSU STEM event. This was not what I was expecting. It was HUGE! Everyone enjoyed it. They had a Verizon truck set up to tour. He explained how they deploy during disasters and helped out. I learned a lot. Bowling Green had a fire engine out for the kids to explore. They all loved this. Brayden won a flashlight from the Toledo Parks department. Checking out a snake skin. Then we headed off to ride the trains again. Brayden asks to go very few places. So when he asked to go on the pumpkin train ride, I knew we needed to figure out how to make it happen in our schedule. He got a hat for next weekend when we go and help the Model train club at a train show. Then we got home and chilled. We played games with the girls and watched movies for the evening. It was really a great family day! When I look at this, I do see we were doing really well at getting our work done. So I know we accomplished quite a bit. It's just my typical not feeling like we are ever doing enough. It's my homeschool mom guilt. There's always so much to learn!